On the surface, in the tranquil seaside town of Monterey, California, everything seems the same. The mothers continue to dote, the husbands support, the children remain adorable and the houses are just as beautiful. But the night of the school fundraiser changed all that, leaving the community reeling as the "Monterey Five" - Madeline, Celeste, Jane, Renata and Bonnie - bond together to pick up the pieces of their shattered lives. With all seven episodes directed and executive produced by Andrea Arnold ("Red Road," "Fish Tank," "Wuthering Heights," "American Honey"; Oscar® winner for "Wasp"), BIG LITTLE LIES features teleplays by David E. Kelley ("Goliath," "Mr. Mercedes"; 11-time Emmy® winner for "Picket Fences," "LA Law," "The Practice," "Ally McBeal" and "Big Little Lies"). The stellar cast includes: Reese Witherspoon (Oscar®, Golden Globe and SAG Award winner for "Walk the Line"; Oscar®, Golden Globe and SAG Award nominee for "Wild"); Nicole Kidman (Emmy®, Golden Globe and SAG Award winner for "Big Little Lies"; Oscar® winner for "The Hours"; Golden Globe winner for "To Die For," "Moulin Rouge!" and "The Hours"); Shailene Woodley (Independent Spirit Award winner, Golden Globe and SAG Award nominee for "The Descendants"; "Adrift," "The Fault in Our Stars"); Laura Dern (Oscar® nominee for "Wild" and "Rambling Rose"; Golden Globe winner for HBO's "Big Little Lies," "Enlightened," "Recount" and "Afterburn;" Emmy® winner for "Big Little Lies"); Zoë Kravitz ("Fantastic Beasts and Where to Find Them," "High Fidelity," "Mad Max: Fury Road"); Meryl Streep (21-time Oscar® nominee; three-time Oscar® winner, for "Kramer vs. Kramer," "Sophie's Choice" and "The Iron Lady"; four-time Golden Globe Award winner, for "The Iron Lady," "Julie & Julia," "The Devil Wears Prada" and "Adaptation"; Emmy®, Golden Globe and SAG Award winner for HBO's "Angels in America"; Adam Scott ("Parks and Recreation," "Black Mass"); James Tupper ("Men in Trees," "Revenge"); Jeffrey Nordling ("Sully," "Motive"); and Douglas Smith (HBO's "Big Love"; "The Bye Bye Man"). 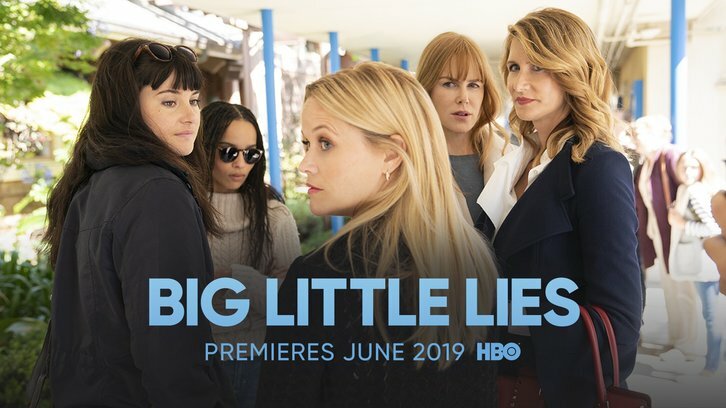 BIG LITTLE LIES is executive produced by the Emmy® and Golden Globe-winning team of Nicole Kidman; Reese Witherspoon; David E. Kelley; Jean-Marc Vallée ("Big Little Lies," HBO's "Sharp Objects," "Dallas Buyers Club," "Wild," "Demolition"); Bruna Papandrea ("Big Little Lies," "Gone Girl," "Wild," "Milk"); Per Saari ("Big Little Lies," "Rabbit Hole," "The Family Fang," "Monte Carlo"); Gregg Fienberg (five-time Emmy® nominee, HBO's "Sharp Objects," "Big Little Lies," "True Blood" and "Deadwood"); and Nathan Ross ("Big Little Lies," "Dallas Buyers Club," "Wild," "Demolition," HBO's "Sharp Objects"); as well as Andrea Arnold and #1 New York Times bestselling author Liane Moriarty ("Big Little Lies," "Truly Madly Guilty," "What Alice Forgot," "Three Wishes," "The Hypnotist's Love Story," "The Husband's Secret," "Nine Perfect Strangers"). BIG LITTLE LIES is a Hello Sunshine/Blossom Films/David E. Kelley Productions production for HBO. Additional cast members include: Robin Weigert (Dr. Amanda Reisman), Crystal Fox (Elizabeth Howard), Sarah Sokolovic (Tori Bachman), P.J. Byrne (Principal Nippal), Merrin Dungey (Detective Adrienne Quilnlan) and Mo McRae (Michael Perkins). Season one of BIG LITTLE LIES was a critical and awards success, garnering 16 Emmy® nominations and eight wins: Outstanding Limited Series; Outstanding Lead Actress in a Limited Series or Movie (Nicole Kidman); Outstanding Supporting Actress in a Limited Series or Movie (Laura Dern); Outstanding Supporting Actor in a Limited Series or Movie (Alexander Skarsgård); Outstanding Directing for a Limited Series, Movie or Dramatic Special (Jean-Marc Vallée); Outstanding Casting for a Limited Series, Movie or Special; Outstanding Contemporary Costumes for a Series, Limited Series or Movie; and Outstanding Music Supervision. BIG LITTLE LIES also garnered four Golden Globes: Best Television Limited Series or Motion Picture Made for TV; Best Performance by an Actress in a Limited Series or Motion Picture Made for Television (Nicole Kidman); Best Performance by an Actor in a Series, Limited Series or Motion Picture Made for Television (Alexander Skarsgård); and Best Performance by an Actress in a Supporting Role in a Series, Limited Series, or Motion Picture Made for Television (Laura Dern).